“Obviously, I love the sport itself. But while I will throw my body out there for my team I’m not in it for that. My brothers used this quote quite a bit in high school: When played correctly as a wide receiver, football is a non contact sport. Interesting isn’t it, how a guy whose ultimate joy in the game is blending in so clearly stands out? In one of the brainier places on earth, Griffin is among the brainiest, a computer science major carrying a 3.9 grade point average. He is working with professor Barbara Engelhardt on a project about machine learning, genomic and health care data, and has done research with professors Dov Grohsgal and Keith Wailoo on the history of the US tobacco industry regarding the social impact of the menthol cigarette. Griffin is the president of Cannon Club. He volunteers about five hours a week at The McGraw Center, a learning consultant program for students deciding about their majors, needing help putting together the most productive class schedule or learning about all the resources available to them at Princeton–Andrew being among the best of them. We would tell you what he enjoys in his spare time except that he doesn’t have any. Applying for Rhodes and Marshall Scholarships is 99 yards from landing one but Griffin is going to take his shot. “At this point I pride myself with having my foot in a couple of different realms,” he said. “I also am interested in government and politics and how that interacts with science technology. “I want to get two different certificates with my computer science degree–one in Technology and Society, which is pretty broad, and other one in Values in Public Life, which is more political science. I don’t yet know what an ideal way to join those would look like. In the lobby of Jadwin Gymnasium there is a Daniel Chester French statue of The Princeton Student; aka Andrew Griffin about 110 years later, wearing a football uniform, graduation gown slung over the shoulder. The 2019 season will begin with full expectations that Griffin, next up at a receivers position hit hard by the graduations of Jesper Horsted and Stephen Carlson, will prove to have softer hands than the sculpture. All good things coming to those who wait, Griffin’s time has arrived, not that this son of an FDIC bank examiner (Clark) and an accountant (Julie) has been twiddling his thumbs for three years on the practice field. Just as a year ago Surace spoke with no anxiety about having to find three new starters plus reliable backups on the offensive line, the coach is not wringing his hands over this year’s biggest project: replacing two of the best receivers in program history. Tiger Bech is back, with two more mighty mites–Jacob Birmelin and Austin Carbone–right behind and Griffin the most senior in a throng of candidates who can catch the ball in a crowd. 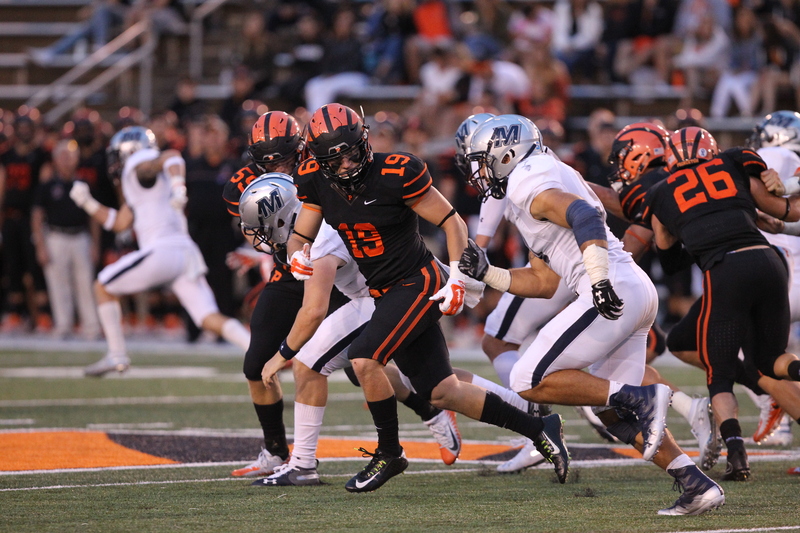 “Andrew is very similar to Connor Kelley [’15] in terms of his size, strength, ability to make contested catches and a willingness to block,” said Surace. “And Connor was a tremendous player here. Put him in coach. Andrew Griffin is ready to play. “Freshman year you are trying to keep your head above water, learn the playbook and not get noticed in a bad way,” Griffin said. “That’s when I latched onto the idea that this is hard but there are a lot of kids doing it. I was able to think about football as a way to build relationships. “Sophomore year you are looking for any chance to get onto the field on special teams. Junior year we had two great senior wideouts and another two (Jordan Argue and Alex Parkinson) on deck contributing at a high level so I just accepted my role as special teams guy and somebody who by practicing well could give [defensive backs and linebackers] work. My time to show what I can do has not been with the ball on Saturdays. It’s Wednesday mornings in February in the weight room. Big and small, fleet and powerful, they keep coming. 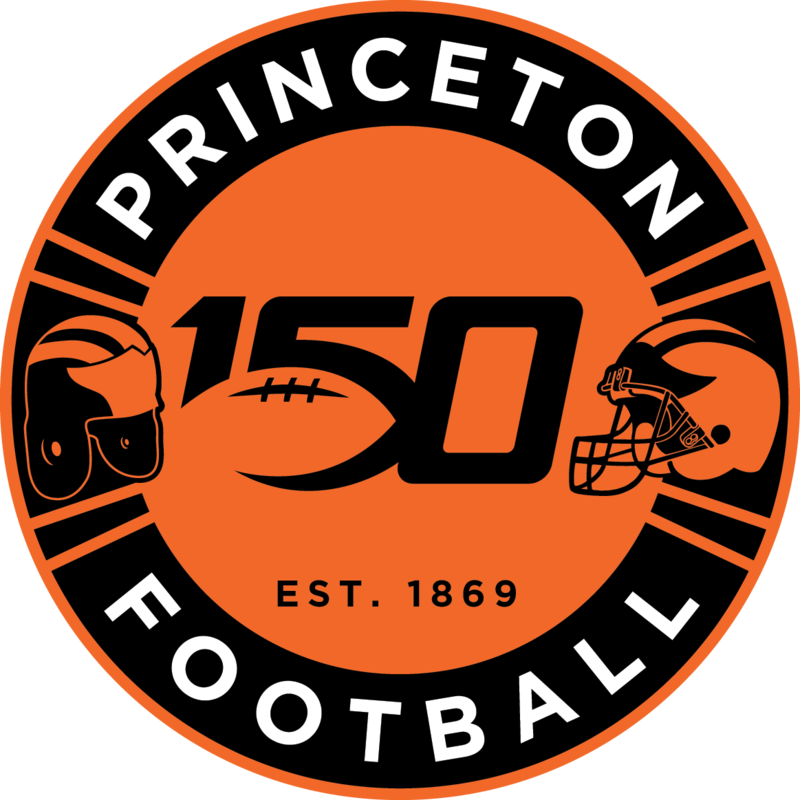 Trey Peacock (’11) was a Bushnell Cup runner up on Surace’s first Princeton team that went 1-9. This has been Receiver U, even if it might be known for a few other things. “It’s going to be a pretty different style,” said Griffin. “We don’t have trees on the outside who can go up and catch balls over guys’ heads on every play but a lot of quick guys and guys who run good routes. Horsted and Carlson could jump and come down with the ball but the 2018 team went 10-0 because its stars were grounded. Griffin is determined not to drop that ball either. “Trying to fill the leadership role of Stephen and Jesper has been the thing I’m more nervous about than performing on the field,” Griffin said. “Guys merit respect just from the fact that they have played, which I really haven’t. I’ve contributed on special teams but haven’t caught third-down passes so I’m trying to find my way to earn people’s respect. In my meeting with Coach Surace going into the winter and spring he said he wanted me to be a leader, but to lead however I best do it. The President of Cannon Club with the 3.9 grade point average also had the highest combined score of all the receivers in weight room tests, 1165 pounds combined in the bench, squat and hang clean. Sweaty business that weight room, but Andrew Griffin cleans up nice. “Mature, thoughtful, and studious,” said Surace. “Always working on something interesting. Andrew does everything right.